7.1 surround sound and Nvidia Ion. Nice! Acer's release-a-thon in New York has thrown us another tasty morsel in computing, this time applying the netbook concept to the desktop and creating the Acer Aspire Revo nettop. Badly chosen labels aside, this little box o' tricks is packed to its teeny rafters with tech-y goodness, with the star performer being the Nvidia Ion chipset to complement the Intel Atom processor. Although Acer could have chosen to use a more powerful combination in the package given that it doesn't have to worry about battery life, the sleek form factor and low power consumption is likely to entice a few customers. Couple this with 7.1 surround sound support, HDMI connectivity and six USB 2.0 slots and it's easy to see why this is being billed as a low-cost alternative to the home media PC. Although there's a distinct lack of optical media support (which is actually more annoying that these companies seem to think as we don't have external DVD ROM drives just kicking around) a small investment for a Blu-ray drive would be an acceptable cost to associate with buying this little nettop. 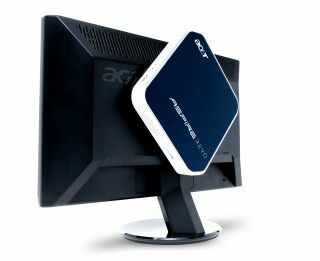 Measuring 180x180x30.5mm, there's still no price on the Acer Aspire Revo, but there is a picture of it stuck to the back of a monitor... we're not sure if this is something real you can do with it or just a fun bit of Photoshop, but hey, we're here to bring your eyeballs pleasure one way or another.